Euroleague Basketball is pleased to announce Jonas Valanciunas of Lietuvos Rytas as the fourth annual winner of the Eurocup Rising Star Trophy. The 19-year-old center has put together a tremendous season for his club, controlling the paint on both ends of the floor to help Rytas reach the 2012 Eurocup Finals. The Eurocup Rising Star Trophy recognizes the most outstanding player in the competition who was younger than 22 on July 1 of the summer before the season started. Motiejunas, who will turn 20 years on May 6, has shown maturity beyond his years, changing games on defense, while posting quite productive numbers on offense. He has led Rytas in rebounds, blocks and performance index ranking, and tied for second in scoring – all in just 24 minutes per game. In the overall standings, the big man ranked second in index (16.9) and rebounding (7.9 rpg.) and fourth in blocks (1.6 bpg.). Simply put, Valanciunas has dominated the Eurocup like few his age ever have. His productivity and talent combined with his role in leading Rytas so deep into the competition make Valanciunas the natural choice as the 2011-12 Eurocup Rising Star! 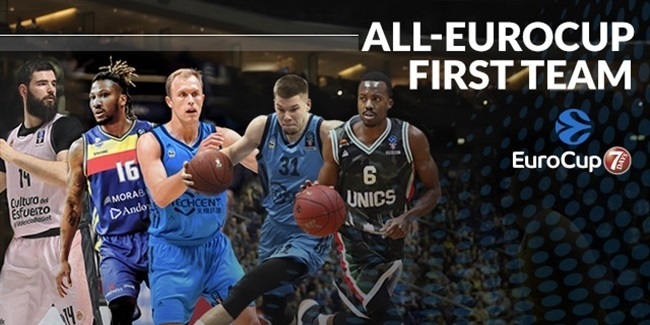 The Rising Star Trophy is part of an expanded awards structure launched before the 2008-09 season to enhance the recognition of the finest Eurocup players for their efforts on the basketball court throughout the season. 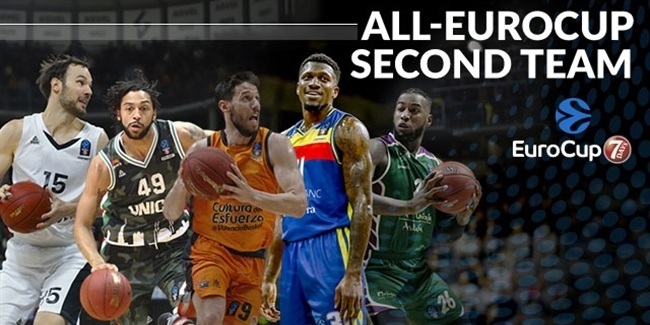 Apart from the Eurocup Rising Star, Euroleague Basketball and its in-house experts also select the All-Eurocup first and second teams and the Eurocup MVP. Additionally, the Eurocup Finals MVP award will go the best player at that event as voted by accredited journalists in attendance during the title game. The Euroleague previously announced Jure Zdovc of Spartak St. Petersburg as the 2011-12 Eurocup Coach of the Year. Valanciunas came off a great summer, in which he led the Lithuanian under-19 team to the gold medal at the World Championships and also played for Lithuania’s senior national team at EuroBasket 2011. Already a basketball icon in Lithuania, Valanciunas then helped L. Rytas to finish the Eurocup Regular Season undefeated with some stellar performances along the way, especially in front of his fans at Siemens Arena. He had 12 points and 8 rebounds against Azovmash and did even better – 13 points and 11 rebounds in 19 minutes – against Le Mans. He even raised his playing level in the Last 16 stage, especially after Rytas's opening loss against Lokomotiv Kuban. He had 17 points and 10 rebounds against Benetton and barely missed another double-double – 12 points and 9 boards – against Alba Berlin. When Rytas faced a make-or-break road game in Treviso, Valanciunas delivered with 17 points on 7-of-9 shooting and 7 rebounds in a critical 74-80 win. Valanciunas continued to shine with team highs of 14 points, 8.5 rebounds and a 22.5 index in the two-game quarterfinals series against BC Donetsk to secure a berth at the Eurocup Finals. 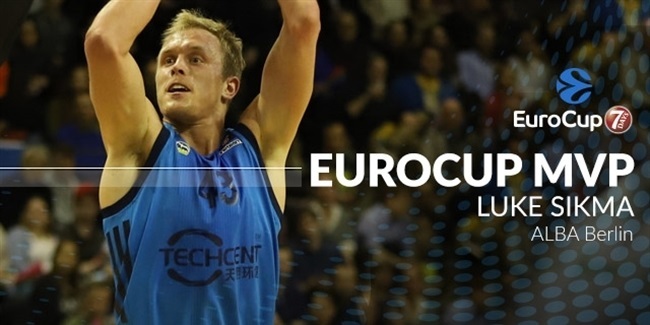 This far he has averaged 11.3 points on 64.1% shooting, 80% free throw shooting, 7.9 rebounds, 1.6 blocks and 3.5 fouls drawn in this Eurocup season. Valanciunas joins Victor Claver of Power Electronics Valencia, Milan Macvan of Hemofarm Vrsac and Donatas Motiejunas of Benetton Basket Bwin on the list of player to win the prestigious Eurocup Rising Star Trophy. He also becomes the youngest player to receive the honor. Now, Valanciunas aims to join Claver, whom he will square off against in the Eurocup semifinals, as the only players to lift the Eurocup title after becoming the Eurocup Rising Star. Valanciunas will finish his spectacular Eurocup season by leading Rytas into the 2012 Eurocup Finals in Khimki, Russia on April 14 and 15.